These are website terms and conditions for a ticketing agency or agent who resells tickets to events organised by a different business or individual. They include strong protection for you if you allow your site visitors to interact with your site - perhaps posting reviews, media or messages. This document provides a simple legal framework with excellent disclaimers. 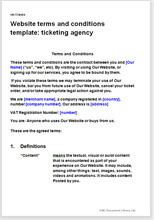 This is website terms and conditions document is for a ticket marketing agency. You sell tickets off this website on behalf of event owners and organisers. One is for a business selling tickets for many events managed by others (this document). The other is for the owner or organiser of a single or multiple events. That is at TandC Ticket sales one event: organiser controls tickets. This is a simple legal framework for the ticket selling, including menus of alternative procedures and options so that you can “choose and use” without skills in legal matters. The events for which you offer tickets could be anything at all so long as attendance is by a ticket. They could be all of a type, like football matches, or could include a wide range of tickets for all types of event. As well as a basic legal framework, the terms cover a model set of rules of attendance, payment and cancellation provisions and strong disclaimers of liability. If you manage your own ticketing sales for your own event, use TandC Ticket sales one event: organiser controls tickets, as we mentioned above. If your site visitors can inter-act with you, or post reviews or messages, you should buy a document which gives greater protection, such as Website terms and conditions template: market place services: leisure events: buyer side. Disclaimers and many matters to protect you. Various matters to protect you. Over 500 words of helpful drafting notes.